【16\" x 12\" BACKBOARD 8\" RIM】Made of durable SHATTER-PROOF polycarbonate. It has protective foam padding on the backboard and brackets in order to minimize impact on your door. With break-away solid plastics rim and strong nylon net, you can practice your slam- dunks anytime and anywhere. 【EASY TO INSTALL AND EASY TO STORAGE】Our mini hoop is light weight and the rim designed for folding. It is quick and easy to mount over most doors or walls. Hoop and net fold for easy storage. 【BRIGHT COLORS AND FASHIONABLE】Children love bright colors and fun beautiful style products. This is the great gift for kids! We toy aims to help your kids to learning to play basketball or keep exercising everyday, and stay away from electronic games. This is also the perfect gift for sports lovers looking to practice their aim. Become a pro from anywhere whatever office or at home. 【BASKETBALLS AND PUMP INCLUDED】Package included: 1x Backboard, 1x Net, 2x Basketball, 1x Pump. 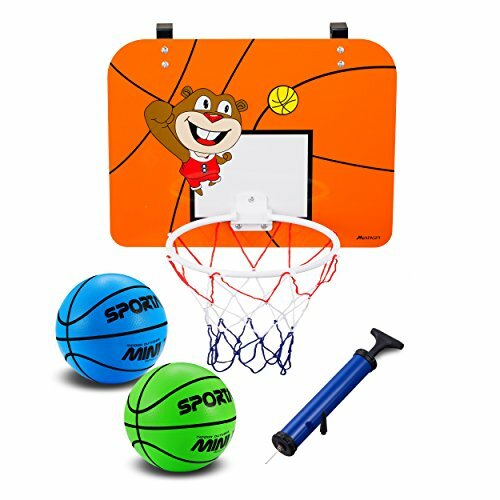 【SATISFACTION GUARANTEE】If you are not satisfied with the mini basketball hoop set for any reason, return it for a 100% refund or provide a new one for free.